The reason Reggie White is the best defensive football player I've seen in 30 years of passionately following the NFL is simple: He was the absolute last man an offensive player wanted to see take the field. Reggie White struck more fear in an offense than Lawrence Taylor. Period. Reggie White did more damage to an offense than Lawrence Taylor. Period. 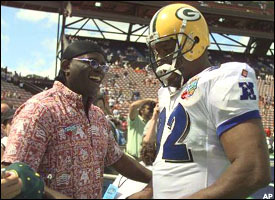 At the 1999 Pro Bowl, the retired L.T. greeted White. L.T. has always received more hype than The Minister of Defense. L.T. was more outrageous, played in the star-making Big Apple, was the enforcer for a larger-than-life head coach in Bill Parcells, and had more personal demons than the Linda Blair in "The Exorcist." For all those reasons and two Super Bowl titles, Taylor has long been regarded as the greatest defensive player of the past 30 years, if not the greatest defensive player of all time. L.T. is No. 2 behind Reggie White. This is not a case of an artist or an object gaining value in death. I'm not overstating White's dominance because he looks better in the rearview mirror. If there is any bias at work, it's the fact that I'm a former offensive lineman, and Reggie White is every offensive lineman's worst nightmare. Reggie couldn't be blocked. You could get in his way. You could cut his legs out from underneath him. As a backside tackle, you could jump on his legs. You could pray. But blocking Reggie White was a near impossibility. And Reggie didn't take plays off. He played the game with the same sort of intensity and energy that made L.T. famous. It's just Reggie played the game as a gentleman.